The main aim of my visit to Morocco was the Chouara Tannery in Fez. I have been waiting for this moment more than 10 years. Once there I can't stop admiring. Just wow!!! Five minutes have been more than enough to discover where my leather bags come from!!! Oh my gosh, how many people are dying for this? And I am still so so selfish that I continue loving my leather bags. 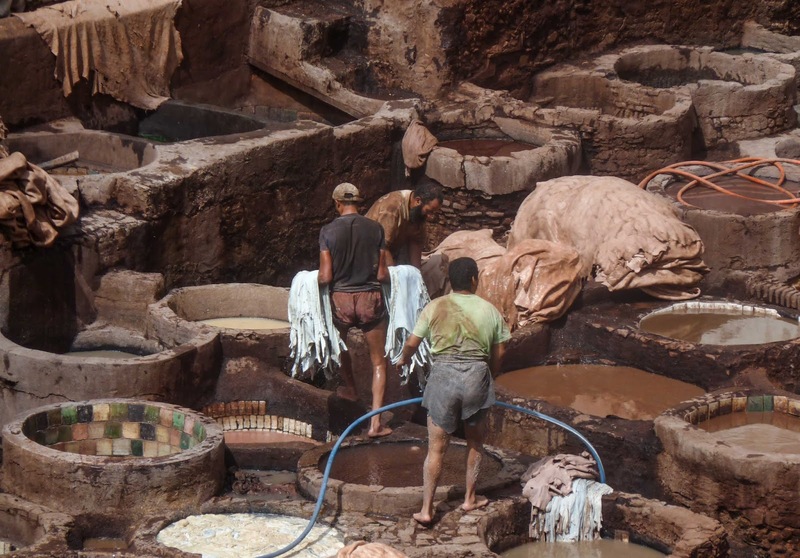 Here following I'm want to share how to visit the Fez Tanneries. Chouara is the oldest Tannery in Fez; it is located out of the medina, about 30 minutes’ walk. If you don’t want to walk then you can catch the taxi as we did. 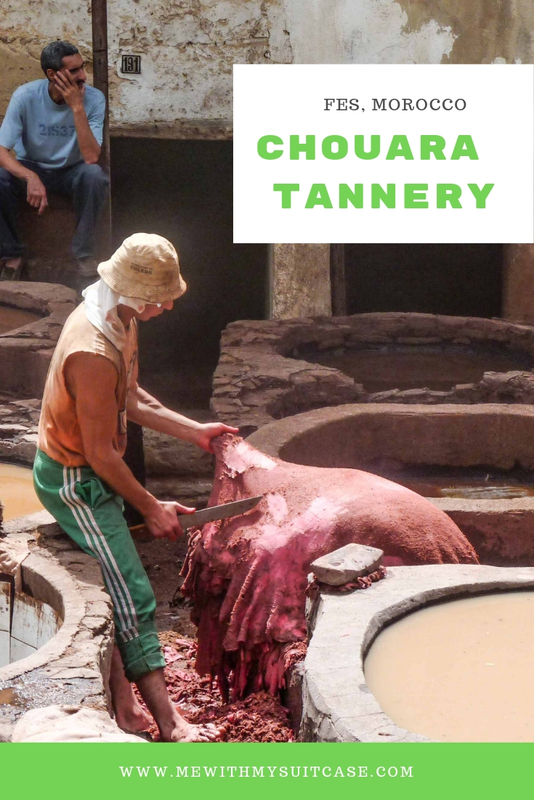 There is another tannery inside the Medina, which is also interesting but not worth as the Chouara Tannery one which is composed of numerous stone vessels filled with a vast range of dyes and various liquids spread out like a tray of watercolours. Men standing waist deep in dyes, work under the hot sun. 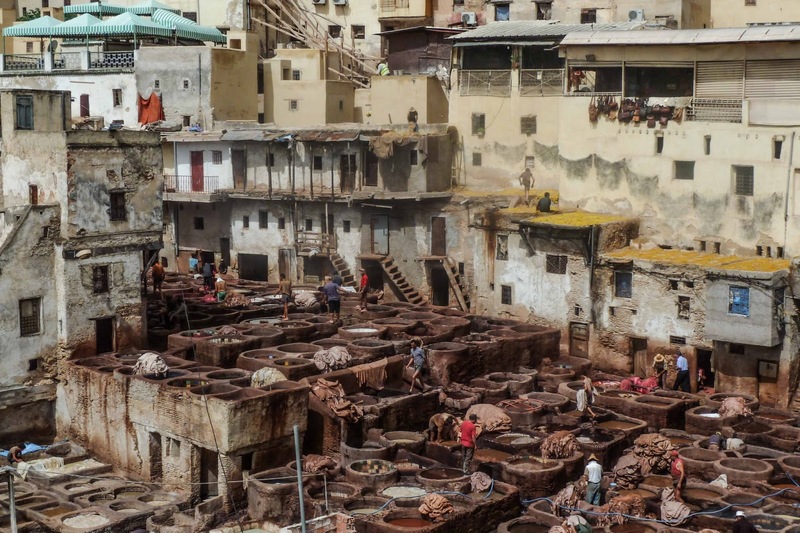 The tanneries process the hides of cows, sheep, goats and camels, turning them into high-quality leather products such as bags, coats, shoes, and slippers. 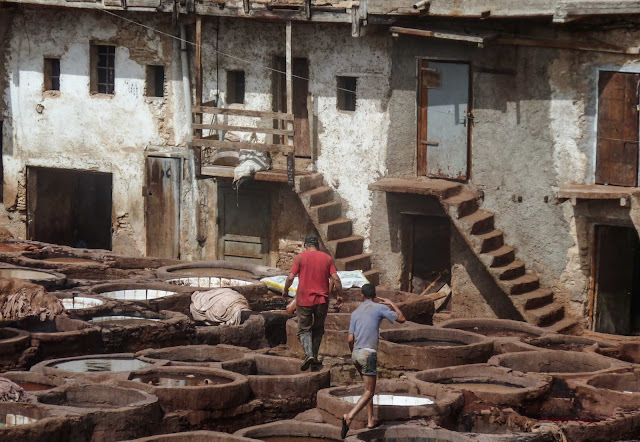 This is all achieved manually, without the need for modern machinery, and the process has not changed since medieval times, which makes these tanneries absolutely fascinating to visit. 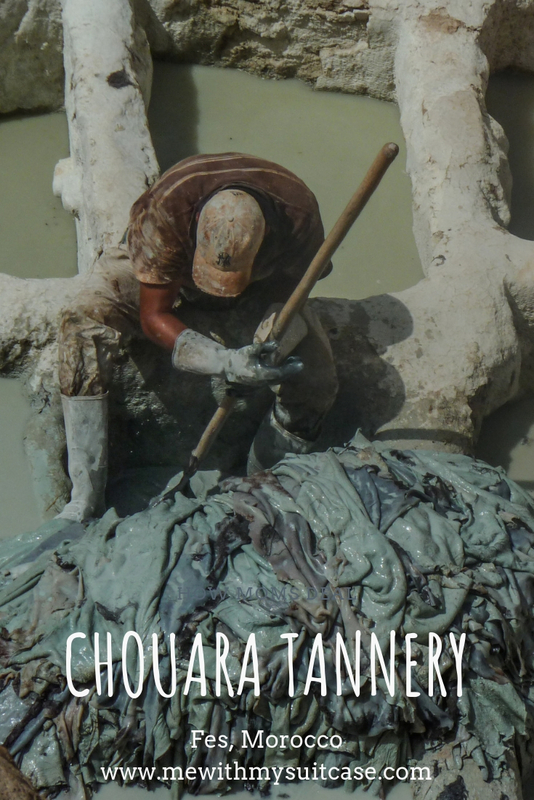 At the Chouara Tannery, hides are first soaked in a mixture of cow urine, quicklime, water, and salt. This mixture helps to break down the tough leather, loosen excess fat, flesh, and hair that remain on them. The hides are soaked for two to three days after which tanners remove excess hair fibes and fat in order to prepare the hides for dyeing. The hides are then soaked in another set of vats containing a mixture of water and pigeon poop. Pigeon poop contains ammonia that acts as softening agents that allows the hides to become malleable so they can absorb the dye. The tanner uses his bare feet to knead the hides for up to three hours to achieve the desired softness. The hides are then placed in dying pits containing natural vegetable dyes, such as poppy flower (red), indigo (blue), henna (orange), cedarwood (brown), mint (green), and saffron (yellow). Other materials used for dyeing include pomegranate powder, which is rubbed on the hides to turn them yellow, and olive oil, which will make them shiny. One the leather is died it is taken out to dry under the sun. The finished leather is then sold to other craftsmen who make the famous Moroccan slippers, as well as wallets, handbags, furniture and other leather accessories. Many of these products make their way into the European markets. 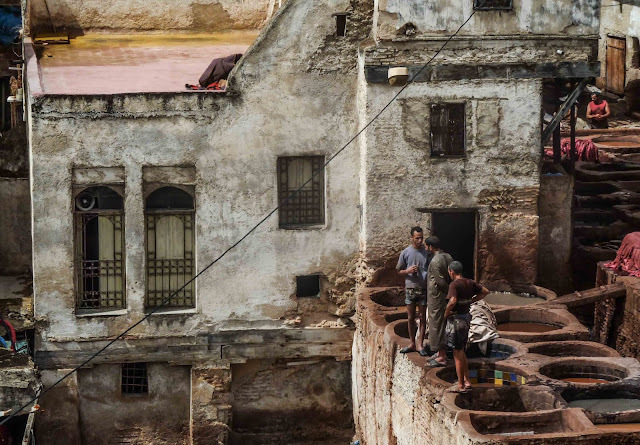 The best views of the tanneries can be obtained from the surrounding terraces where the leather shops are located. Just visit one of the shops and ask for a tour, and the salesperson will give you the rundown on how the hides are treated and what dyes come from what plants. 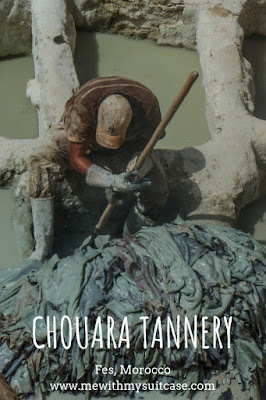 There are no entry fees to the Tannery but as it is necessary to pass through the leather shops to reach the terraces overlooking the tannery, expect the inevitable attempt to sell you something. They try their best to sell you some leather stuff and if you are not interested in leather items, they will try to sell you something else. We bought some cream bottles for 50 Dirham each, found it for ten later in Marrakesh. Buying leather goods in Fes seemed quite cheaper than in Marrakech and if you are a good negotiator then you can get it for less than half price. 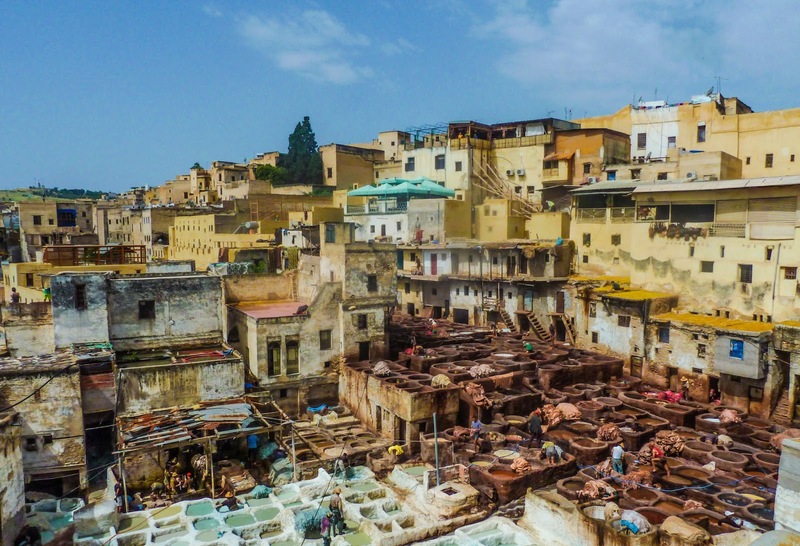 As I told you, you can't actually enter into the Chouara Tannery of FeZ; you can look at it only from the terraces of the surrounding buildings. I and my friend have been able to get down close to them and take some fantastic pictures. The pigeon poop and cow urine produce a stench so pungent that the tour guide will supply, upon arrival, sprigs of fresh mint to visitors to help them overcome the smell. Yes, it stinks but that's the process. It was a revelation and amazing to learn why and what and where and who... It is, of course, mesmerizing but on the other hand, you truly feel pity for those ones who work hours and hours under the hot sun in such a very bad condition. I wonder myself if it is possible doing something to improve their standard of living.